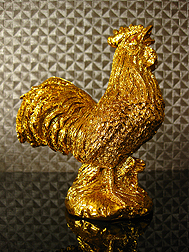 This strong gestured large-sized rooster is finished elegantly with gold chrome. 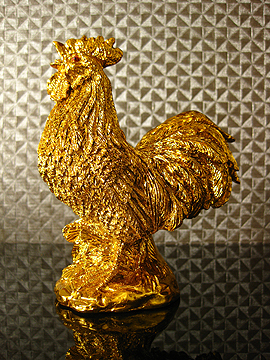 Rooster in gold is said to be the strongest form by old-style feng shui masters. It has a solid crown on its head with a well shaped beak. Its tail is also attractive and showing off its masculinity. Its gesture is firm, confident and fierce to prevent 3rd party intrusion of a relationship and ensures adherence to conjugal faithfulness and fidelity. It is also excellent to counter office politics or defend against business competitors. 1. The rooster will help to solve political problems in office, backstabbing, arguments and harmful peers when placed on your office desk. For modern offices that have cubicles that resemble a centipede arrangement, place the rooster on the boss' desk to kill the centipede that causes quarreling, havoc and irritation in office. 2. For businessmen, it is best to get a rooster facing outwards at the main entrance to ensure your competitors are kept at bay. The powerful rooster will help you counter attack their poisonous threat. 3. For married couples, you should be proud if your spouses are attractive. But you should also cautiously prevent centipede third party from affecting your relationship. Place a golden rooster facing outwards at the maindoor to prevent your spouse from being snatched away. You can also display it by your bed. 4. For those seeking for fame luck, you may place a proud rooster at the south corner of your living room or at your business premise to increase recognition luck. 5. For neighbourhood and apartments that has problematic centipede piping, roads or drain, the rooster is definitely a must at the dining area. 6. For kids that is suffering from worms in the stomach, it is best to place the rooster in their bedroom.